Parenthood is an adventure. Join Hike it Baby 30 April and Take it Outside. Discover great hiking tips from the community and motivate yourself to get out there every day. Hike it Baby 30 is Hike it Baby’s biannual fundraiser and membership-based virtual challenge to encourage families across the globe to get their babies and children outside more. You don’t need to live in a Hike it Baby city to participate! Registration for the April challenge is now closed. Registration for the September 2019 challenge opens August 15. If you have any questions please reach out to us via email – challenge@hikeitbaby.com. 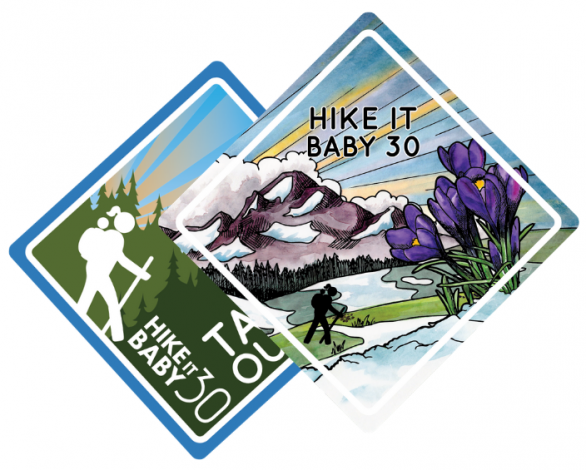 The biannual Hike it Baby 30 is how we raise funds to improve your tools, fund the scholarship fund to get more families out on the trail, and make the nonprofit even better. Contributions are tax-deductible. Every donation makes a difference and allows us to support more families. To participate in HiB30 you only need to add one product to your cart. If you choose Take it Outside it already includes the HiB30 benefits. Receive a challenge sticker from Sticker Mule at the end of the challenge. Access to Facebook challenge group. Access to HiB online tracker and downloadable tracker. Automatically entered to win prizes from our sponsors at the end of the challenge. Prizes awarded to members outside the U.S. will be based on if the prize sponsor is able to ship internationally. Sliding scale donation option: $10 & $15 – sticker; $25 donation includes a magnet; $30 – Sunday Afternoons HiB Busy Hiker hat; $50 – HiB Button & Sunday Afternoons HiB Busy Hiker hat. 30 days of daily emails of inspiration, reminders. 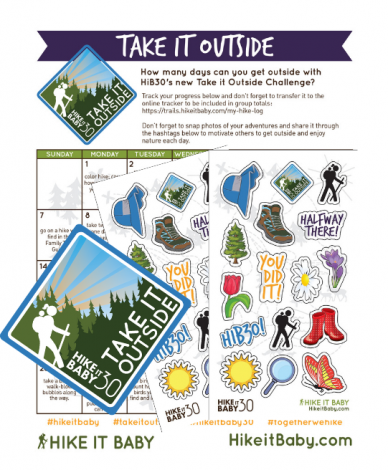 Access to a downloadable “Take it Outside” guide with 30 days of activities. Sticker sheet with stickers to track your progress on the activity calendar. Additional celebratory sticker featuring the unique Take it Outside design. Entry to a special giveaway for Take it Outside participants. PLUS all of the HiB30 benefits listed above. 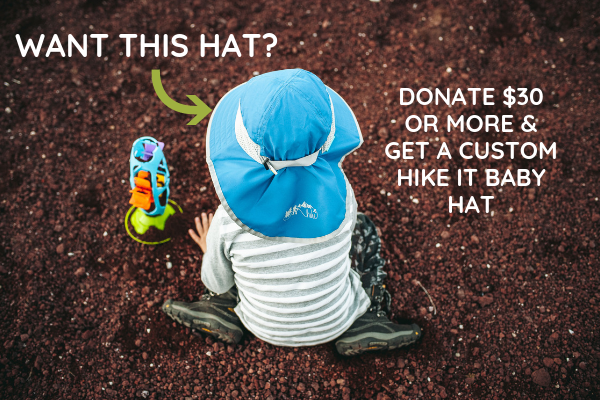 Sliding scale donation option: $15 – sticker pack; $30 – Sunday Afternoons HiB Busy Hiker hat; $50 – HiB Button & Sunday Afternoons HiB Busy Hiker hat. Limited to challenge group access only. Experience the challenge community and get the support you need to help get your family outside. DOES NOT INCLUDE HiB30 sticker, tracking log or other HiB30 benefits. Limited to the challenge group only. At this time the Hike it Baby 30 is open to participation from any country, however, most prizes are awarded to participants in the USA due to shipping restrictions. International participants will have the opportunity to win a select number of prizes from partners who have International distributors.